I cannot begin to describe how much I adore the Banda Islands. Bama and I have recently spent the second half of September happily marooned on this tiny archipelago in the seas of eastern Indonesia. Both of us consider it one of the most beautiful places we have ever been to, and while I mull over exactly how to write about its incredible history and the wonders we saw, I will introduce Banda with photos of its people. Generally I find it much easier to take pictures of scenery, architecture, food – things that are unlikely to say ‘no’ if you point your camera at them. But Banda is the kind of place that makes you feel completely at ease, and like the rest of Indonesia, people are more than willing to have their picture taken. I was also nudged along by several of my favourite bloggers: Jeff Bell’s photo essay on the people of Flores and Sulawesi, Madhu’s Faces of Jodhpur, and Alison and Don’s stunning portraits from Asia, Oceania and the Americas all inspired me in a big way. Bu Rosani serves up the best fruit smoothies, nasi campur (mixed rice) and fresh tomato sambal in the main town of Banda Neira. She runs her own restaurant, Rumah Makan Nusantara, with her husband and children just a few doors down from the ferry pier. We came every day for a meal and a mango, avocado or banana smoothie – each one so luscious it was like ice cream. By the end of our two weeks, Bu Rosani was sliding us plates of homemade cake for dessert. On Sunday mornings, local residents come out in droves to sweep the streets of Banda Neira. When these three women saw my camera they waved me over and asked to have a photo. I showed them the result on the display screen and smiled, saying, “cantik semua!” (everyone is beautiful). This had them roaring with laughter – I hope it made their day. 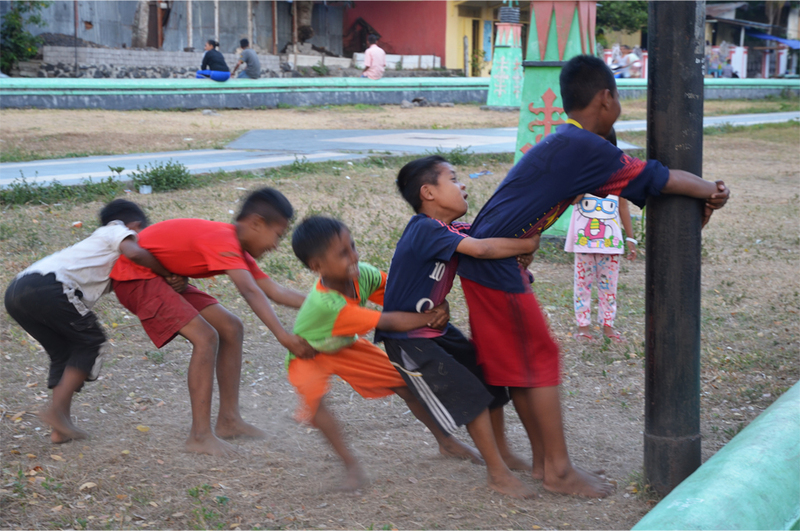 The kids of Banda Neira playing barefoot (without parental supervision) in a small park in front of the old church. Their counterparts in Hong Kong could never get that kind of freedom, and I am sure that most do not enjoy a childhood as natural as this. Bang Uci was our boat captain on the two day trips we took to Banda’s outer islands. While the other guests were busy snorkelling off Pulau Ai, Bama and I stayed on the boat and listened to Bang Uci’s stories. 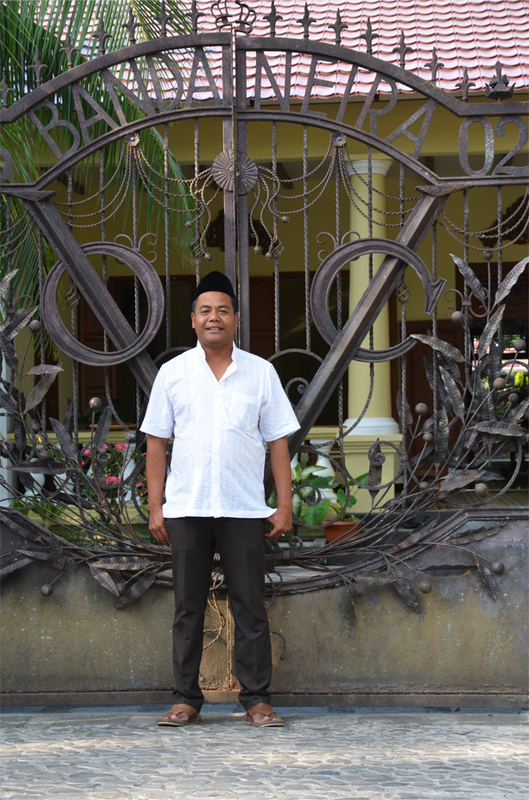 He told us about his home village of Selamon on the big island of Banda Besar, and some of the local legends. 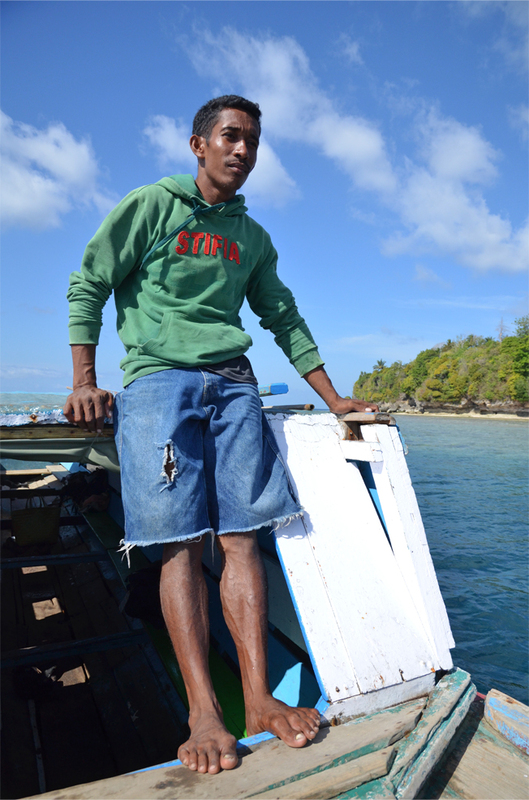 When Bang Uci was a student, he would sometimes commute to high school in Banda Neira in a dugout canoe because the motor boat was often late. Luckily he capsized only once. One morning the National Geographic Orion expedition cruise ship was docked in Banda Neira – a short stopover on a three-week voyage from Singapore to West Papua. The young women in the preceding two photos were preparing to greet the passengers outside the old Dutch governor’s residence, and many were rehearsing the ‘nutmeg dance’ with their baskets. 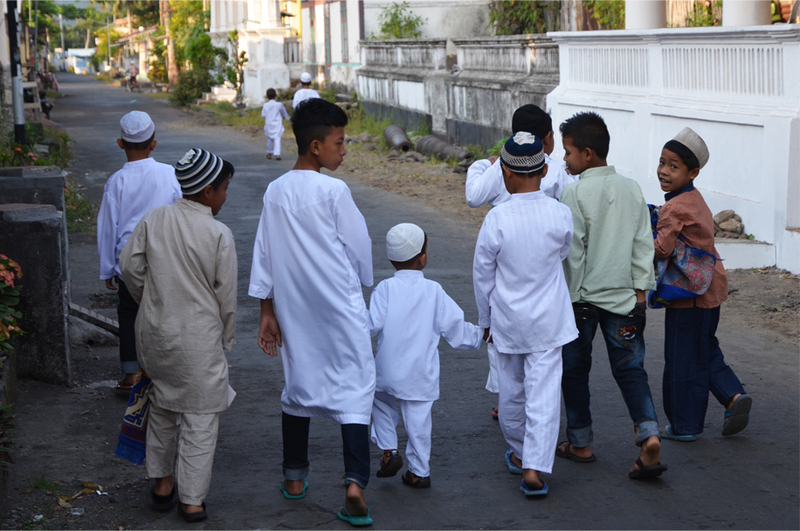 We were in Banda on Idul Adha, the annual Muslim ‘Feast of the Sacrifice’. The guesthouse owner suggested us to get up early so we could photograph the Bandanese in traditional dress going to morning prayers. 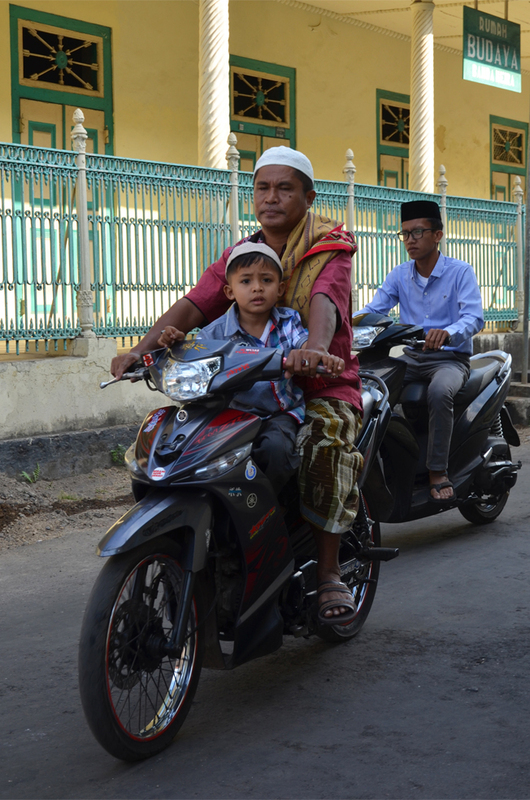 I love the juxtaposition you get when Indonesians ride their motorbikes in ceremonial clothing. Walking down one of the main streets in Banda Neira lined with old colonial houses. What made this photo so special was the single head turned back towards the camera. You can also see two Dutch cannon lying abandoned on the ground. 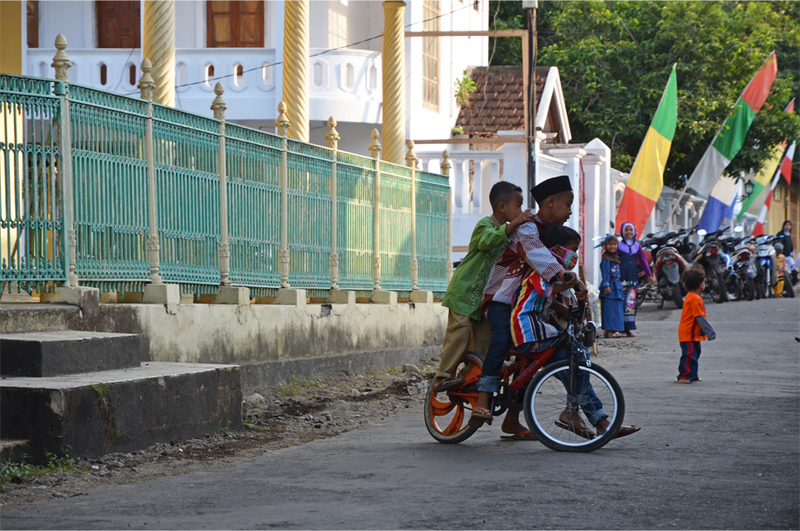 A delicate balancing act – kids on wheels in front of Banda Neira’s local museum (known as Rumah Budaya, literally ‘Culture House’). 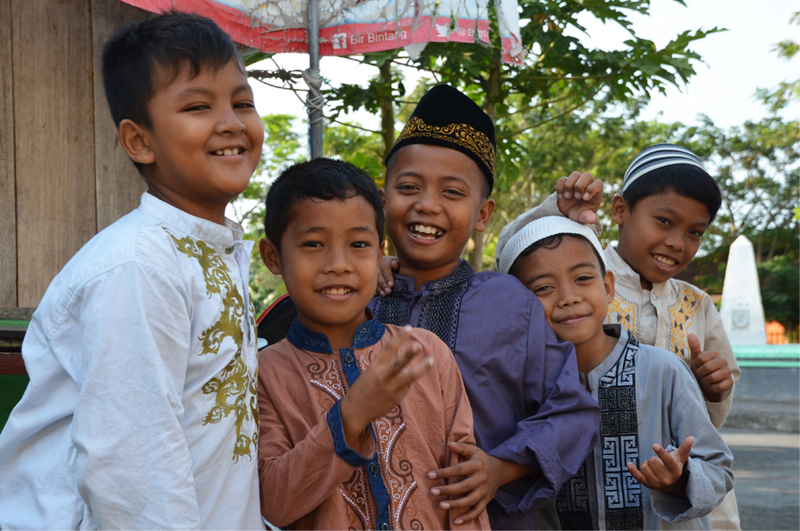 Indonesians have such beautiful smiles – these kids loved the camera attention! Banda is one of my favourite places on the entire planet – I know how fortunate I was to stay there for two whole weeks! Thank you – the Bandanese are such a photogenic bunch! Heart-warming photos. I especially love the ones of the boys…they radiate joy. Makes me want to visit Indonesia again soon (and go to Banda, which I’ve not done). Thanks! Those boys were naturals – some of the adults were a bit camera shy and stiffened up once they looked into the lens. It happened to Bu Rosani but luckily we managed to coax her back into her usual smile. I love those beautiful smiles and people in your photos. All the people seem to have on interesting clothes in these shots – very photogenic. Speaking of interesting clothes, I found my sweet batik shirt I bought in Indonesia but forgot about. I’ll need to start wearing that. Thanks for the mention. I look forward to seeing more of your people photos. You’re welcome, Jeff. I always wanted to have a post about the Indonesian smile, and here it is! As for the interesting clothes, I guess I cheated a bit because so many of these shots were taken on Idul Adha. We really lucked out with our timing in Banda. Lovely, lovely portraits! Especially love the two groups of happy children. The smiles on their faces underscore your description of the islands. Banda is now on my Indonesia wish list. Appreciate the mention James. Like Jeff, I too look forward to more of your people photos. Thank you so much, Madhu! I am really hoping that you and R will get to visit Banda at some point. It is notoriously difficult to reach, but there is now an express ferry and scheduled flights on a 10-seater propeller plane from Ambon, the nearest major city. Wonderful! 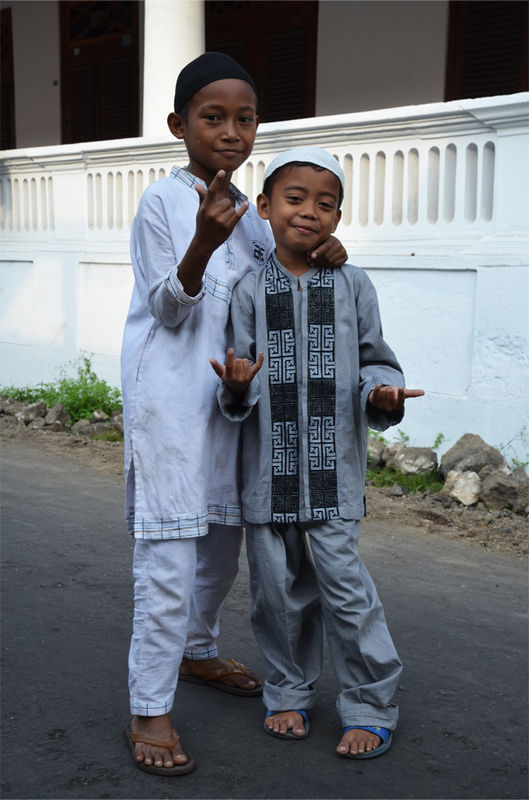 I especially loved the two little boys striking a pose outside the mosque. That is one of my favourite people shots from Banda. It was so easy to photograph those boys! Such a joy to read and look at the photos. Natural portraits like these are so revealing about a country. I agree. 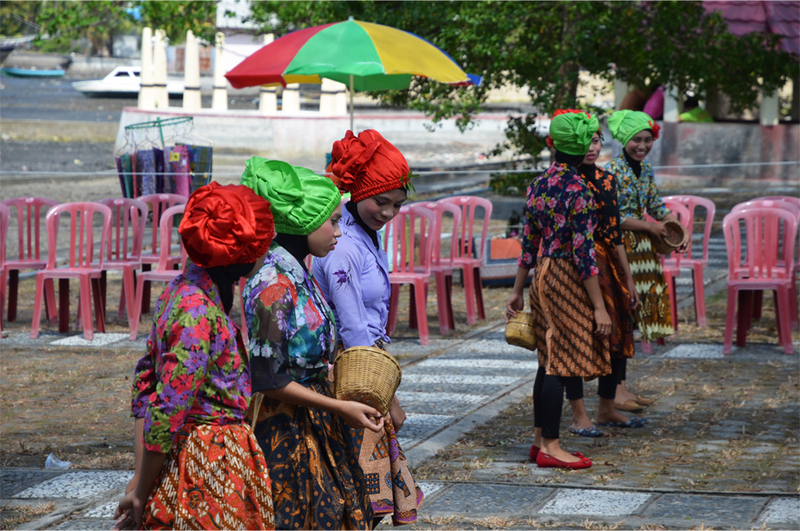 You can already detect the warm-hearted, easygoing nature of the Bandanese from these photos. 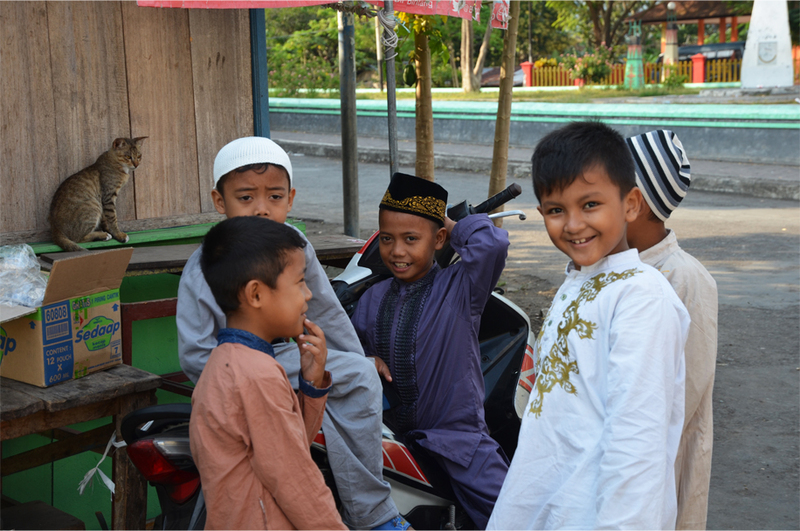 Really like this post, and the photos are so cool…Idul Adha…it’s funny because the Indonesians have changed the spelling and pronunciation a bit from its original Arabic…which is Eid Al Adha. Are you really marooned? Or just loving it? The same thing has happened with Eid Al-Fitr (hope I spelt that right!) – the Indonesians call it ‘Idul Fitri’. I loved being in such a quiet, remote place and feeling cut off from the outside world. There was WiFi at the hotel but we used it sparingly. Sometimes, it’s just wise to let go and be who you are in the moment. Thank you so much, Randall. I have learned through your own blog that the pictures often speak for themselves. Banda is just one of those places where words tend to fail me – I hope I can do justice to the history of the islands in my next post. Ei James, espectaculares fotos y descripción de esa maravillosa gente y la vida que llevan. En sus caras se ve una desbordante felicidad de vivir una vida plena, pese a que quizás no tienen las comodidades y privilegios de las naciones más desarrolladas. Me encantó, sigue haciendo publicaciones de este tipo porque nos ayuda a los que estamos más lejos a abrir nuestros ojos y vivir la cultura del encuentro y la inclusión con todos los que nos rodean. Muchísimas gracias, Jorge. Me alegro de que las fotos te hayan gustado tanto, está claro que los niños de esas islas todavía tienen una felicidad que hemos perdido en nuestros propios países. Ya lo creo, tú lo has dicho. (Si alguna vez vueles a pasar por España me dices ) un abrazo! Thank you for reblogging this post – it’s much appreciated.